The RG184 is a majestic looking, sturdy man amethyst ring. 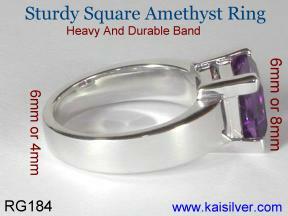 The rich color of the amethyst gemstone stands out against the solid white gold band. The design of this ring is perfect for a man gem stone band ring and will look awesome no matter which gemstone you choose. Amethyst is the February birthstone and represents the zodiac sign Aquarius. As an anniversary gemstone the amethyst represents the 6th (sixth) anniversary. The ring is therefore very suitable as a man amethyst birthstone ring or as an anniversary gemstone ring for males. The ring is shown here in white gold, but can also be ordered as a yellow gold man amethyst ring. 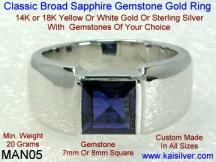 Like all Kaisilver jewelry this men's amethyst ring has high end craftsmanship and is handfinished to perfection. If you like the design of this amethyst band ring but prefer another gemstone, remember that all our jewelry is available with all gemstone options. With direct and preferential access to over 200 million carats of gemstones, we can procure just about any gemstone that you need. All gemstones are hand picked and custom cut by experts and we do not use low grade reject quality gemstones. We created the world's first collection of high end rings for men and all our designs are well researched taking into consideration the active lifestyle and habits of modern men. You can choose from 14k or 18k white or yellow gold but we recommend 14k gold because of it's hardness. Our rings contain 50% to 60% more gold weight as compared to what other jewellers would offer for similar designs. This adds to the long term durability of your man gemstone rings and also keeps the gemstones and diamonds more firmly mounted. With our extra weight, high quality designs and high end craftsmanship, you cannot make a simple price comparison between Kaisilver men's rings and those offered by other sellers. Low weight and cheap rings are cheap only in the short run, as such jewelry will bend and dent at the slightest impact and needs frequent repair. The gemstone mounting in light weight jewelry is also not sturdy and you could lose your diamonds or other precious gems. This man amethyst ring has a square amethyst gemstone in the center. The gemstone size is either 7mm or 8mm depending on the type of gemstone. We also have an option for a 6mm square gemstone to enable the same square gemstone ring to be made with a narrower band. 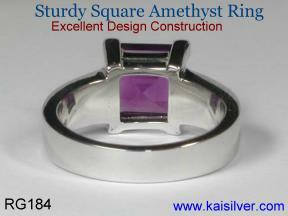 The amethyst gemstone in this gemstone men's band ring can be replaced with any other gemstone. The construction of the ring is thick and durable and you can notice the strong prongs that firmly grasp the square gemstone at each corner. This ring can be ordered in all sizes and can be made as a white gold man amethyst ring or as a yellow gold men's gemstone band ring. Along with the option for white or yellow gold and the choice of an unlimited range of gemstones, we offer you a high degree of customization and flexibility that no other seller can match. These man amethyst rings have a very healthy gold weight depending on the size of the center gemstone and the ring size. The broad band of this man gemstone band ring, tapers very gradually and still remains at an imposing width even behind the finger. The table below shows the weight of the ring depending on the size of the gemstone selected and also the ring size. The band width of this man amethyst gemstone ring also varies with the size of the square gemstone selected for the ring. The ring tapers very gradually towards the back of the finger, see the details in the table. All designs can be modified as per your requirements and you can email us at sales@kaisilver.com with any queries that you might have. 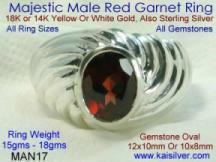 You can also order this ring as a complete gemstone band ring for men with a uniform band width throughout. Let us know if you prefer this option and we will work out details of gold weight and costing for you. 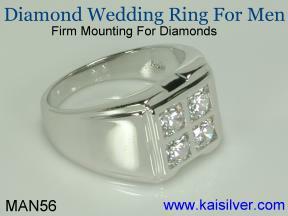 Ring Features: Kaisilver created the world's first collection of men's high end custom made rings. A team of designers and craftsmen spent many months studying the lifestyle and habits of modern men. This intense research yielded valuable information that was used as inputs for all our man ring designs. We proved to the world that men's rings need not be boring, mundane and crude. We also did not expect men to give up their liking for heavy gold rings. Our designs created a virtual revolution by emphasising equally on stlye, craftsmanship and long term durability. No one had ever tried to combine these features in man rings before Kaisilver. 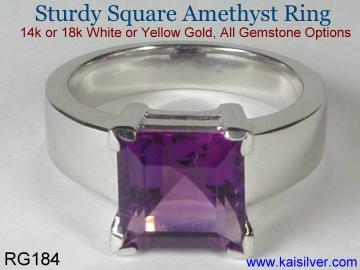 Below are a few highlights related to the RG184 man amethyst ring design. (01) These man amethyst rings have a good gold weight and this is an important factor in ensuring that your man gemstone band ring stays in shape for a long time. The ring is sturdy and strong and will not bend and twist with every impact. You will notice the thickness and width of the band as shown in the images. The good gold weight also allows for a secure gemstone mounting. (02) Your amethyst gold men's ring comes with thick and sturdy prongs to hold the gemstone in place. 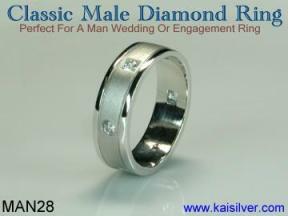 Light and thin prongs are not suitable for men's rings. They do help to bring down the overall gold weight and thereby provide a low price tag, however they play havoc with the long term condition of your ring. Thin prongs stick in pockets and other places, this causes them to gradually open up and loosen the gemstone. You will end up paying for expensive repairs and replacing lost gemstones. (03) The gemstone man band ring that you see here is a white gold amethyst men's ring. You can order the same ring design with all gemstone options. Since all gemstones are hand picked and custom cut by experts we can fulfill all your requests. We do not indulge in gimmicks where low grade and reject quality gemstones are set in light weight junk and sold under the name of 'close outs' and 'blow outs'. In some cases different grades of gemstones are available and prices vary according to grades. This is specially true of rubies, sapphires, emeralds, tanzanite and some other gems. Our gemstone experts will advise you regarding all options and provide price quotes too. 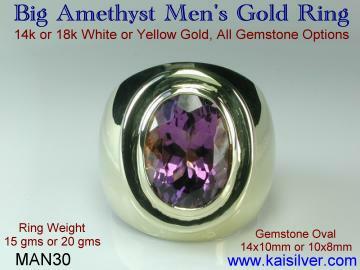 (04) These amethyst men's rings and infact all other jewelry from Kaisilver has high end craftsmanship. Some of the world's finest craftsmen and artisans work on each jewel under the watchful eye of our designers. We have quality control checks at each phase of production and follow, what would easily be the most stringent quality standards in the industry. While the immense amount of manual work does result in longer production times, it is also the only way that true high end jewelry can be made. (05) This February birthstone ring has a good and sturdy band. This is possible because of the very healthy gold weight that we provide. There is a slight tapering of the band, but you can also request for your man gemstone band ring to have a uniform band width throughout. 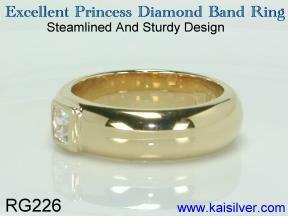 Besides the good width of the band, you will be impressed with the thickness of the gold too. 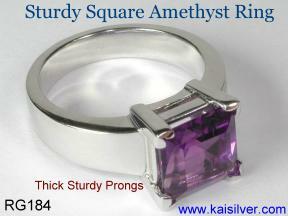 You can also vary the width of the band by changing the size of the center square gemstone. For example, a 6mm gemstone would give a band width of 6mm and a band width of 8mm can be obtained with a 8mm square gemstone in the ring. (07) All design modifications are possible and you can also send us images of your favourite designs. 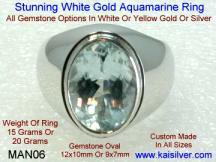 All jewelry can be custom made in 14k or 18k, yellow or white gold with gemstones of your choice. For men's rings we would recommend 14k gold because of it's hardness. The active lifestyle of today's modern men requires that men's rings are strong, sturdy and reliable. Another very impressive man amethyst ring. This amethyst men's ring has a good quality, eye clean oval amethyst gem stone. You can order a gold or sterling silver amethyst man ring, get the same good metal weight and craftsmanship for both options. Click for more details. 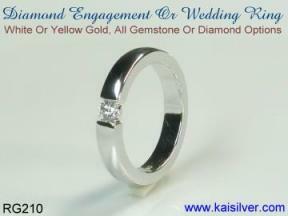 Kaisilver has proved that you need not burn up your lifetime savings or mortgage your house to get that diamond ring that you always wanted. At the same time you do not need to settle for the light weight, low grade diamond jewelry with diamonds that look like, white opaque pieces of powdered glass. Our designers have worked for months to deliver diamond ring designs that look gorgeous and are yet very affordable. Every ring has high end craftsmanship with good proportional gold weight. You also have the option to combine gemstones and diamonds in the same ring. Click for our diamond engagement rings section. Our diamond rings have opened up a whole new opportunity for lovers of diamond rings, who could not afford those rings with massive price tags and yet stayed away from the light weight junk diamond jewelry with substandard craftsmanship. View our designs and feel the difference. High Level Of Buyer Confidence: Our buyers include fashion models, TV news readers, lawyers, scientists, members of the U.S and U.K armed forces, owners of resorts and hotels and people from all walks of life. Buyers have been surprised at the high quality of merchandise and service that we provide. Our efforts to bring back the human touch to online selling have been appreciated by over 5,000 buyers in 17 nations. You can view some of our buyer feedback at Click Here for a few buyer comments. Payments We prefer payments through paypal. We do not recommend Western Union Transfers for first time buyers. Western Union is more suitable for repeat buyers, once the realtionship and trust between you and us has been established. We are International Verified Premium Account holders for paypal and you can therefore transact with confidence. Our email for paypal is info@kaisilver.com Please let us know if you wish to use, any of the other payment methods mentioned above and we will provide you with details for the same.